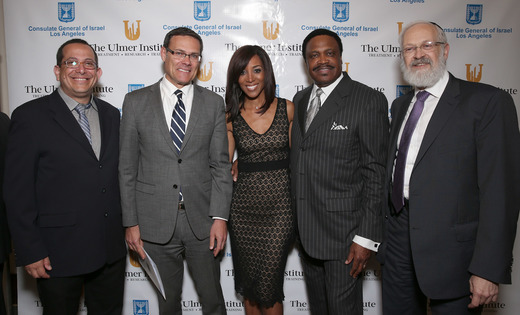 *TUI – Leaders from African-American and Jewish Communities recently joined together to celebrate the launch of The Ulmer Institute ( TUI ). Hosted by Consul General of Israel David Siegel and former Access Hollywood Entertainment Correspondent Shaun Robinson. Additional guests included LL Cool J and his wife, designer Simone Smith, Bill Duke, Louis Gossett Jr., Cantor Nathan Lam of Stephen S. Wise, Rabbi Elazar Muskin of Young Israel of Century City, and Dean Marilyn Flynn of the USC School of Social Work. The Ulmer Institute (TUI) is a 501(c)(3) organization focused on treating, researching, and training professional and community leaders on issues relating to urban psychological trauma and resulting PTSD and trauma spectrum disorders. The Ulmer Institute will become the premier trauma treatment and research institute in The United States. Our methods will be rooted heavily in partnership with the Israeli psychological community, the Jewish community, LA based clinics, hospitals, centers of faith, and research universities. The vision for The Ulmer Institute was inspired by an experience Founder Dr. Kenneth Ulmer had in Israel. It began in a flash as a rocket exploded in Tel Aviv directly over his head and he and his team saw the terrifying power of terrorism and the incredible resilience of the Israeli people in response. Dr. Ulmer quickly learned that there is something profound and unique about the methods Israel utilizes to manage community psychological health and resiliency. Rather than treating psychological trauma as strictly a military issue, Israeli society has chosen to address it as a community issue that commands action from all levels of society. Dr. Ulmer was deeply inspired and upon his return to the United States, connected with IDF Chief Psychologist Dr. Eyal Fruchter whom has since become a trusted advisor and partner in translating Israeli hope and health solutions to some of the most psychologically traumatized communities in the United States. Provide state-of-the-art, trauma-focused support and treatment for victims of urban traumas including but not limited to physical andsexual assault, crime-related trauma, gunshot violence, and other traumatic events that leave victims with PTSD and other trauma spectrum disorders. Provide education, training, and consultation resources for mental health professionals, clinical staﬀ, students, and community-basedorganizations in the principles and practice of modern innovative trauma prevention and intervention practices. Our staff will also be focused on prevention of PTSD and spectrum trauma through seminars and school sessions focused on increasing the psychological resiliency of youth. From its foundation, The Ulmer Institute has been developed in partnership with the Jewish community through the foresight of founder Bishop Ulmer to use the trauma initiative as a spark to reinitiate dialogue and friendship between African American and Jewish communities, with Israel at the center of the conversation. Inclusive of major international Jewish community organizations and lay leadership, congregations and rabbis, TUIs partnerships with the community are deep and broad. Below is a list of programs TUI has completed and others that are in various stages of planning and development.